Pending legislation in New Mexico would enable renewable energy certificates to be issued for the generation and use of thermal energy produced from renewable resources, with extra credits assigned to thermal energy generated from forest biomass. A 32-page report by Lux Research picks winners and losers in 2012 among alternative fuel developers. The state of the market report, which is provided only to clients, also predicts that many companies will generate real revenue in 2013. Viaspace Inc. has announced that it has entered into a contract with Agri-Corp of Managua, Nicaragua and is growing Giant King Grass on land owned by them. Agri-Corp shareholders and Viaspace plan to co-develop a biomass electric power plant. Cereplast Inc. has announced the incorporation of a new wholly owned subsidiary, Algaeplast Inc. Algaeplast's focus will be the development and manufacture of algae-based bioplastics. Aduro Biopolymers has announced it has secured investment from Wallace Corp., a rendering business. Aduro Biopolymers is currently developing a novel material based on an unconventional idea; turning bloodmeal into bioplastic. The Australian Greens has published a new energy proposal calling for investment in clean energy infrastructure. The report describes scenarios for meeting Western Australia's electricity demand through efficiency,fuel switching and renewable energy. ElectraTherm distributor GB Consulting and biogas plant constructor EnviTec commissioned an ElectraTherm Green Machine to generate additional power and increase energy efficiency on site, and the machine has accrued more than 2,800 hours. Drax Group plc has released preliminary financial results for 2012, noting that its biomass transformation is well underway. According to company's report, its first unit will be converted to biomass in April, with a second unit converted in 2014. 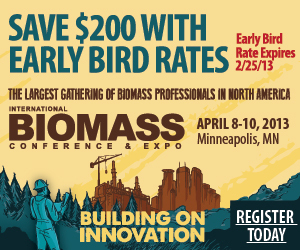 Nominations are now open for 2013 International Biomass Conference & Expo Bioenergy Awards. The awards will be presented during the opening general session at the sixth annual International Biomass Conference & Expo in April. Sustainable Development Technology Canada has awarded $61.8 million in funding to 23 clean energy projects through its SD Tech Fund. Two of the projects focus on the production of bio-coal. Agricultural biogas plant project developer Bio Alians recently published a paper on the Polish ag biogas market, which indicates there is significant room for growth in the sector, compared to other biogas substrates. When storms, disease or old age down trees and limbs in city parks, the wood waste will now be sold to Recast Energy Louisville LLC and turned into energy that helps power Louisville companies and organizations, instead of going to the landfill. The U.K. Department for Environment, Food and Rural Affairs recently published experimental statistics on the quantity of land used to grow bioenergy feedstocks in the U.K.. The Federal Energy Regulatory Commission's Office of Energy Projects has released its Energy Infrastructure Update for January 2013, showing that six new biomass power units were brought online in January with a combined capacity of 6 MW. BioNitrogen Corp. has announced that it has received approval from the Florida governor to issue up to $175 million of tax exempt bonds. The bond offering is slated for completion in early 2013. Stanford University's Global Climate and Energy Project has released a report highlighting the potential to combine bioenergy production with carbon capture and storage techniques to enable carbon-negative energy production. The California Energy Commission awarded more than $4.4 million to Blue Line Transfer and Sacramento Municipal Utility District biogas projects. Biogas produced at each project will be upgraded for use as transportation fuel. The Algae Biomass Organization has announced that the 2013 Annual Algae Biomass Summit will take place Sept. 30 - Oct. 3 at the Hilton Orlando in Florida. Proposals and abstracts for speaking and poster opportunities are currently being accepted. Pending legislation in the U.S. House of Representatives aims to limit the ability of the U.S. EPA to increase the cellulosic biofuel requirements its sets each year under the renewable fuel standard (RFS). MIT chemical engineers and biologists have devised a way to dramatically boost isobutanol production in yeast, which naturally make it in small amounts. They engineered yeast so that isobutanol synthesis takes place entirely within mitochondria.